Our true worth is not measured comparatively. It is not found in being more than some things or less than others. It stands in it's own right and is self evident. It is often in the areas of our struggles, not in the things that come most easily that it is revealed. Anyone who has had a little kid make them a card or a picture and you can tell that they worked at it lovingly, knows this. As an uncle (officially and unofficially), I've had some stuff on my fridge from nieces and nephews that I have treasured. I didn't look at it and say "oh the depth perception is all wrong, what kind of nonsense is this"? I don't think anyone with a heart would de-value something like that, and yet how often are we self discouraging. Thoughts like "oh I could never be any good at that" or "So and so is much better at this sort of thing than I" often sideline our creativity, or in some instances our opportunities for growth or being a voice to what we see as need. There is a great difference between judging and discerning. I like to think of it like what you see in an Olympic sport, like figure skating. When we watch a figure skater we sometimes see in the corner of the screen the skater's coach and occasionally we see the judges, but the judges don't hold up numbers while the skater is skating. They wait till the skater is done. The judges are only involved in that one limited event, while the coach will probably be working with that skater further along, whether they win or lose that day they will be back at practice and back in training and needing constructive feedback. In our own work, we occasionally have to judge our actions in particular situations. Maybe we blow up at a colleague or we gain a satisfying victory in a challenge. These moments of downfall or attainment are important but tomorrow is another day. We take from these experiences the business of discernment, to learn and keep doing, to not throw in the towel and to look at our progress. I have had to learn to be more of a discerning coach with myself and less of a cranky judge. I can remember a time where someone suggested I take a class in something I wasn't good at, something where I maybe wouldn't necessarily ever be good at it but to learn anyway. I ended up taking pottery. It was a lot of fun. The stuff I made was pretty lopsided and much of it I couldn't even pass off as a paper weight, but it gave me a pretty good appreciation of what goes into making a beautiful bowl or a good hand crafted mug. I learned about different kinds of glazes and what makes somethings work and some things not. I can see and appreciate the craftsmanship. About a year later, by coincidence I dated a very nice person who happened to be a potter. One day when I was visiting, I saw some (what I thought) beautiful bowls by his back door, when I commented on one, I was told; "oh they're mistakes, that one has a crack near the lip, I'm throwing them away". I asked him for that bowl and I'm glad I did, I still treasure it. In a funny way it ended up representing the relationship. We're still friendly despite a crack or two, and there's somethings, like that friendship, worth keeping. Our own inner worth works like that. The feelings of debt, the feelings of owing or in many instances the need to pay things forward that have been given to me, are all powerful motivators. Sure I love to share what I'm good at, but I have also learned to welcome the opportunities to do things where I'm not and to appreciate better in others the things they share. At the same time, my values sometimes show me situations and relationships that don't always balance. Sometimes it is important to leave things and people that are not compatible with our growth, but these experiences as teachers also have their worth. 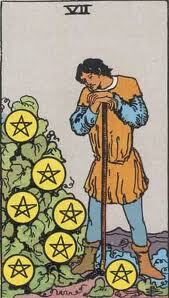 In Tarot the suit of Pentacles refers a great deal to our material security, our possessions and our financial affairs. Issues of profit and loss. On an inner level I have found that it refers to our natural values. When we pay attention to these things, like a gardener pays attention to the values of a plant, we see what makes things grow in ourselves and in our affairs and alternately what makes us wither. When our values are properly aligned, when we are "in our element", we see results and there is progress, a positive payoff. When we aren't aligned, when we are out of touch with those values it really doesn't matter what we gain or not, we aren't satisfied.Sometimes we get hooked into the negative payoff. Discernment helps me to find what I need to move forward, what I can let go of and where I need to be to offer best what I can. "As far as service goes, it can take the form of a million things. To do service, you don't have to be a doctor working in the slums for free, or become a social worker. 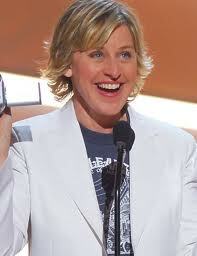 Your position in life and what you do doesn't matter as much as how you do what you do". "The purpose of our lives is to be happy". 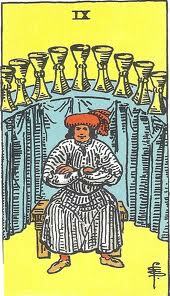 The court cards in Tarot, are on a symbolic level unto themselves. Where the majors, such as Temperance, Wheel Of Fortune, Death Etc. seem to talk about lessons, experiences and archetypes we can relate to, the minors (Ace through 10) are the circumstances that both trigger as well as are circumstantially affected by our learning. I often also see the Aces as a class unto themselves, but that's another long winded post. So what to make of these characters that show up? On one level they are the people that are part of the learning that is going on, at the same time they can be aspects of ourselves that are evoked in these situations. I also find they are useful as an indication of awareness. The very nature of these being called "court" cards suggests a rank. We think of Kings being "higher up" than Queens or Knights and Pages. In Tarot however, I don't find this to be the case. 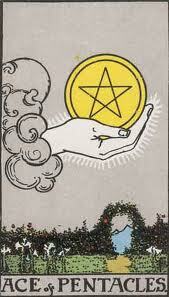 All of the cards are necessary and it is in how they articulate that we see significance. I often refer to court cards as "modalities". Like gears on a stick-shift they can be an indication of how we are operating. If it sounds confusing that a card can mean both an external element as well as something within ourselves, we are reminded of one of the seven hermetic laws; "as within, so without". This is also what I refer to as "congruence". One of the things that a reading can do is show where patterns and associations occur in our life experience. What is useful in one area can often be pertinent in another. When we encounter challenging people for instance, we can ask ourselves where these people push buttons in our own character. 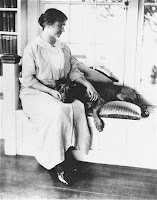 The people who come up in a reading are often an indication of lessons and experiences in ourselves. It is often important to note that the relevance of these people to our life experience is not the entirety of the person i.e., a king of swords reversed to one person might well not be reversed to another or may be described in an entirely different way or with a different symbol altogether. The law of attraction also plays into this. People who register in our consciousness are drawn into our lives in terms of lessons and experiences we are going through. There is a cause and effect. Court cards as modalities are also not just about people, but rather a kind of atmosphere where our consciousness is being taken into account. A predominance is not just a bunch of symbols coming up, but also the feeling that the symbol is predominating. Bear in mind the relationship of elements within elements. Kings are the fire of an element. I see fire as the essence of constructiveness and doing. A predominance of Kings would suggest an atmosphere of authority perhaps, a time of strong accountability and having to be responsible in that vein. 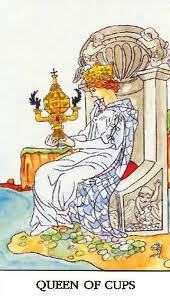 Queens (the water of an element) would suggest an atmosphere of support, nurture and growth inducing. The conscious sense of guiding growth. 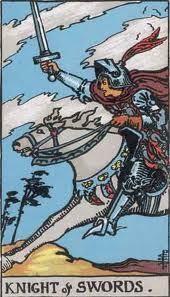 Knights, (the air of an element) would be discourse and sharing, the conscious questing for answers. To me they also symbolise a kind of sibling like association, fraternal or sororal, and a kind of team work or team building. Pages are the earth aspect of an element so they would suggest a kind of continuation. A lineage and apprenticeship of experience. Pages can suggest new learning, the relationship of mentors to those of lesser experience. So Court cards can put us on notice of where it is important to shift gears. When I look at a fully self actualized person (and in this sense I think of Ellen Degeneres), I see someone who knows when to be in authority, when to nurture, when to be in team work and when to be childlike and teachable. None of these states are superior to one another. Each has it's part to play. This is also why I think ascribing a single court card to a person, although very useful in some senses, is a lot like merely looking at one's sun sign in astrology. I am for instance, an Aries, but I have an Aquarius moon and my rising sign is different. 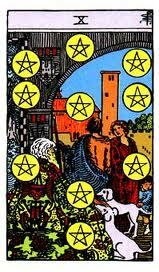 Where we are at in terms of our elements could be described as a person being King of cups in one aspect and Page of pentacles in another. I find it interesting too, that environment and situations can sometimes be individualized. A business for instance that is just beginning, could be symbolized by a page. A support group by a queen. An old guard form of government by a king. 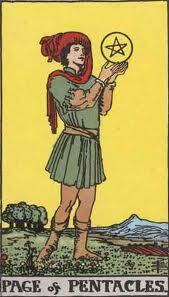 Some books on Tarot suggest pages can represent messages or the bearers of news. If some of this seems frustrating, it may be from the standpoint of those that have to form hard and fast rules of what the cards have to mean. Reading them is not simply studying meanings but how they interact. What they say to you. I often find the readings where they say more than one thing to be interesting and where that more than one thing points in a certain direction, all the more affirming. I also don't always hold with the gender rules of court cards or the age rules or the physical descriptions. Not all dark haired men are good with money, not all fair haired women are competitive. One has to look at the patterns and trends and know when an aspect is speaking up and when it is quiet. I believe it is by working with these patterns and associations you start to see inflections and thats when the cards really start to ell you things. 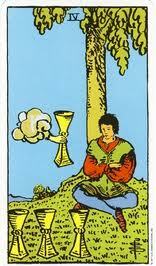 Of course it isn't so much the cards as your own intuitive process that gets triggered by this. *If you managed to get through all this and you aren't gnashing your teeth, you probably deserve a cookie or something good. I value the thoughts and insights of others. These are just some of my own associations. "Trying to cut others down doesnt make you taller and those you are trying to impress will invariably recognise how small and petty you are being. Appreciate others, look up to them, delight in their growth and what they've overcome and you grow greater than you thought possible." It's been a while since my last post, summer with various commitments and distractions, personally and in terms of both work and community involvements was a whirlwind for me. It's nice to have a day to reflect on that and to be back in a frame of mind to write and share, sorry I've been away so long. Often the things I post here arise out of questions that come up frequently, both in my own personal journey and in the issues I see others working with. We are moving through times of great change, not only in our circumstances, but also in how we are having to deal with these things. Priorities change and our self worth comes to be reflected in things differently. I sometimes have my own struggles and times of doubt, I'd hardly be human if I didn't (and those who know me personally will assure you I'm VERY human indeed). I have the enormous privilege though of having work that I love and in that work the opportunity to learn in the doing and in the growth of others. In the nearly 30 years I have been a reader, I rarely take time off. Even in times of personal loss or setback, my job has helped me find direction. Being self employed too, time off comes when time off comes. There are slow periods and it always seems that these come at points where I need to shift gears, learn in other things or have time for solitude. It works out usually. Sometimes this has worried me but less so in the last few years. I've found a little more trust in my own resourcefulness. A few years ago during such a period I decided to go back to school in my free time for a little upgrading. This led to a little side job in an adult learning environment. I had the great experience of being in the midst of many people from all over the world that were trying to improve themselves. I still like to do little side things like that from time to time, sometimes on a volunteer basis and occasionally during leaner seasons out of necessity. These are all things I bring back to my job as a reader. I also have done a fair bit of community work on committees. They say if you want to face your imperfections, see where you need to grow (and grow up) get on a committee. That's very true. Being self employed I need the occasional experience of working with others and even sometimes getting a come-uppance. The last few years I have made some very good friends and done a lot of growing (some of it with the odd ego bruise or two). Through it all my work is a constant. Having these experiences makes me more fluent, able to relate and be intuitive to similar things for others. To empathise and to also then take my own medicine in seeing what's right for someone else. We all have blind spots, some of these things, the more egoic things, can seem to be glaring to a bystander. 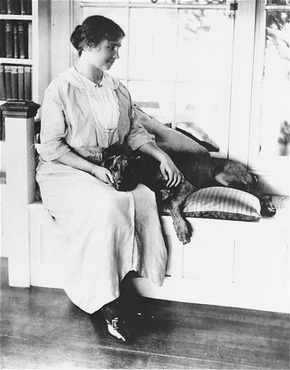 I try to follow the maxim that the irksome things in others are usually touching some nerve within myself. Being open, understanding and compassionate is a two way street. 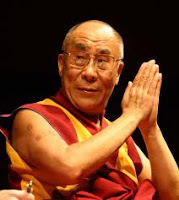 When I have the opportunity to be compassionate to others going through stuff, I can be more easy going with me. I try to be accountable and when I make a mistake or blunder, to stay in the game. Usually this is where I do the most growing. My best friends are the ones that are able to take me with a grain of salt. When I get riled up they're able to look at me and say "oh you get this way", and they've taught me to do the same with me. That's the two way street. Part of why Tarot is such a useful tool is that it's archetypes reflect human experiences that we all have in different ways. I call reading an art form because like all creativity it is a sharing. A way of appreciating others unique experience but at the same time saying we are not alone, others have come through this too. I find great comfort in that.